In this bull market, investors have clearly preferred growth stocks to value stocks. But they’ve been reasonably hot toward restaurant stocks, too. The Restaurant Finance Monitor Stock INDXX — which includes quick-service, fast casual, and full service restaurant stocks — has gained over 700% from crisis-era lows. Those gains in fact outpace those of the S&P 500 over that time. Admittedly, some of the gains come from the fact that restaurant stocks, in particular, were clobbered in the bear market of 2008-09. Still, a strengthening economy clearly is making its way to the restaurant sector. That’s shown by both the gains in the space and the recent buyouts of operators like Panera Bread and Buffalo Wild Wings. For those investors who see the bull market continuing — or downright accelerating — growth stocks in the restaurant space would seem an attractive target. Admittedly — like most growth stocks in this market — valuations look reasonably full. But these 7 stocks at the least have the potential to grow into those valuations, if not continue their bull runs. Shake Shack (NYSE:SHAK) looks like an awful lot of other growth stocks in this market. The opportunity is obvious. Shake Shack believes it can grow to 450 U.S. locations — quadruple its current footprint. International expansion offers another long-term growth driver. Customers love the restaurant’s concept, and higher prices relative to quick-service operators like McDonald’s (NYSE:MCD) and Burger King owner Restaurant Brands International (NYSE:QSR) suggest higher long-term margins as well. But the valuation suggests the market has priced in at least some of that opportunity. SHAK stock trades at 80x forward earnings and about 32x this year’s EBITDA. As a result, SHAK remains one of the most shorted stocks in the market. Some 24% of the float is sold short (a figure that actually has come down of late). From here, the company’s Q2 earnings suggest that caution is advised. As impressive as the new store opportunity is, traffic is declining at existing stores, and the footprint expansion will take years, if not decades. It remains to be seen if investors will be that patient. The story at Tex-Mex concept Chuy’s Holdings (NASDAQ:CHUY) sounds familiar as well. The small-cap ($464 million market capitalization) company has a large opportunity to expand nationwide. The number of locations has risen from 8 in 2006 to roughly 100 by the end of this year. Yet the company still hasn’t even touched the Northeast or the West Coast. But like so many smaller operators — think Fiesta Restaurant Group (NASDAQ:FRGI), Zoes Kitchen (NYSE:ZOES), or Potbelly (NASDAQ:PBPB) — same-restaurant sales have weakened along the way. Comps were negative in 2017, a performance that’s guided to repeat in 2018. And that’s led CHUY stock to pull back sharply. The stock sits about one-third below early 2014 highs, and tumbled again after Q2 earnings earlier this month. But it leaves CHUY in an interesting spot. The long-term opportunity remains intact. In the near term, the company is looking to improve marketing and labor management, while also increasing off-premise sales. If those efforts work, the long-term opportunity looks stronger, and CHUY likely rebounds from current levels. If it doesn’t, the 23x forward EPS multiple here looks far too high, and the stock tumbles. Speaking of familiar stocks, there’s Domino’s Pizza (NYSE:DPZ). DPZ stock raises the question I’ve asked a few times of late — most recently with Microsoft (NASDAQ:MSFT): what do you do when a wonderful company has a stock with a potentially stretched valuation? DPZ, after all, trades at 31x forward earnings. The stock has risen over 500% since the beginning of 2013. Clearly, the turnaround here has been impressively executed. And the ongoing struggles at rival Papa John’s (NASDAQ:PZZA) and stagnant performance from QSR’s Pizza Hut suggest more market share gains for DPZ going forward. Add the leverage of the company’s franchise model and growth should continue to be sharp going forward. But just shy of $300, how much of that growth really is priced in? And how much risk? As Luke Lango pointed out last month, Domino’s delivery edge may be undercut by technological changes. Meanwhile, Chuy’s isn’t the only operator looking to grow its delivery and takeout share. Larger companies like Chili’s owner Brinker International (NYSE:EAT) and Dine Brands Global (NYSE:DIN) are doing the same. Domino’s is going to grow, and its dominance in pizza seems likely to be assured for some time to come. The question is what exactly that dominance is worth. The turnaround at The Habit Restaurants (NASDAQ:HABT) has taken hold. HABT has doubled just since early May. The big gains came after the Q2 report earlier this month, when the burger chain owner crushed consensus estimates and gave strong guidance, leading the stock up 22%. But the gains may not be over. HABT still looks reasonably cheap on a price to sales basis, with a revenue just over 1x. Comps weakened of late, but if momentum is heading in the right direction — as appears to be the case — soft comparisons can help reported numbers for the next few quarters. Habit has operations in only 11 states, so it too can add new stores. In fact, the store count is growing double-digits this year, which helped drive 23% revenue growth in Q2. Earnings multiples are a bit higher, but if comps stay strong, margin expansion will solve that problem rather quickly, even after the gains. And at a market cap of $435 million, a renewed — and larger — Habit could drive big upside for investors willing to climb on the rally a bit late. Dave & Buster’s (NASDAQ:PLAY) is another turnaround story, but the turnaround hasn’t quite played out. Comparable-restaurant sales fell 4.9% in the company’s fiscal first quarter. But even that performance — along with the naming of a new CEO — was enough to allow PLAY stock to soar after the Q1 release. And if the turnaround here takes hold, PLAY looks downright cheap. Unit growth is guided to 13-14% this year, so new locations are a driver. Getting comps back into positive territory should expand margins and profits. And at ~10x EBITDA and 20x P/E, valuation isn’t that stretched yet. There are concerns here, as Lango detailed back in June. But with Q1 earnings due in a couple of weeks and strong macro trends, another earnings surprise could jumpstart another rally in PLAY stock. Are the Shares of WING Stock Overdone? Even aggressive growth stock investors might want to let the valuation at Wingstop (NASDAQ:WING) settle down a bit. WING stock has gained 83% so far this year, and a 68x forward P/E multiple makes it one of the most expensive restaurant stocks out there. Tom Taulli noted that the valuation might be getting a bit toppy coming out of a Q2 beat in August. Margins are currently benefiting from lower wing prices, and that could reverse. That said, there might not be a better story in the sector right now. 75% of Wingstop’s business comes from takeout — the same category so many peers are trying to grow. It’s making significant efforts to improve its technological capabilities, making ordering easier (and improving margins). Indeed, it’s hard to think of a more millennial-friendly business than a tech-savvy purveyor of takeout Buffalo wings. Personally, I’d want the valuation to come down a bit, as impressive as growth has been. But WING’s results, and story, are such that waiting for a pullback may be a fool’s errand. 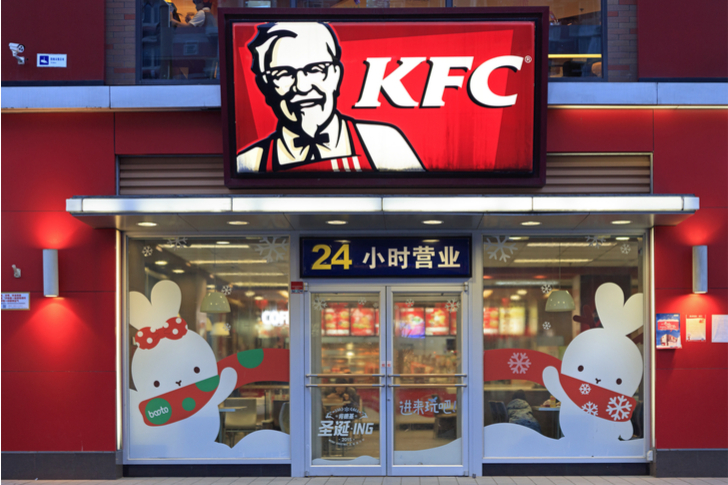 Yum China Holdings (NYSE:YUMC) was split from Yum! Brands (NYSE:YUM) to highlight the company’s growth opportunity in China. And at first, investors liked what they saw. YUMC rose from $25 to over $45 at the beginning of the year. But the stock has struggled since late January, pulling back over 20%. A disappointing Q1 hit the stock. Lately though, buyout rumors have boosted the stock, with news that Yum China had rejected a sale leading to a 3%+ gain on Tuesday. But YUMC still looks reasonably cheap, at ~25x earnings and less than two times revenue. There are risks here. Most notably, a China-U.S. trade war could lead to rising nationalism, as BofA argued in a downgrade this week. Chinese stocks have entered a bear market, driven by increasing fears about the health of the country’s economy. And the Pizza Hut concept has disappointed, including a -1% same-restaurant sales print in Q1. But there also are reasons that big money is eyeing the company. There’s a massive long-term opportunity here in a growing economy with a quickly expanding middle class. Yum was a first mover in the country, and its brands have become entrenched in key markets. There’s still a lot of growth ahead over time, even if near-term results have disappointed. And if Yum China management won’t sell, perhaps that means they see that growth coming sooner than investors might think. The post 7 Best Restaurant Stocks to Bite Into Today appeared first on InvestorPlace.